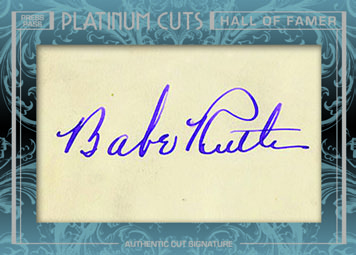 2013 Press Pass Platinum Cuts Inscription Edition joins a growing line of cut signature releases. Drawing from an eclectic mix of signers, the product is framed around several themes. From Hollywood to sports to history, the set covers a lot of ground. The list of signers in 2013 Press Pass Platinum Cuts goes back more than 100 years and extends all the way up to the present. Abraham Lincoln, Harry Houdini and Princess Diana are among the historical figures with autographs. A "Golden Age of Hollywood" theme focuses on such names as Errol Flynn, Judy Garland, John Wayne, Elizabeth Taylor and Marlon Brando, who was a notoriously reclusive signer. Clint Eastwood, Sean Connery and Dennis Hopper are among the more recent names on the checklist. 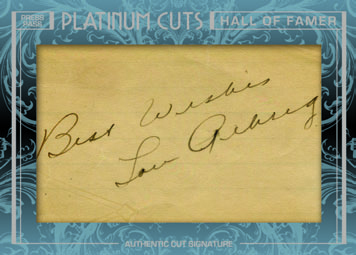 Sports legends include Babe Ruth, Ty Cobb, Honus Wagner and Lou Gehrig. 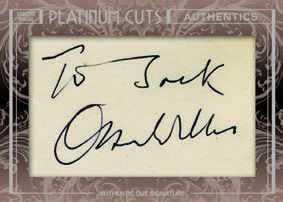 2013 Press Pass Platinum Cuts has several inscribed autographs numbered to either 9 or 1. For example, William Shatner signed some, "Star Trek" and Anthony Michael Hall added "The Breakfast Club." Dual- and triple-signature cards pair figures who share a common bond, often by appearing in the same film or TV show. Among the combinations are Clint Eastwood, Lee Van Cleef and Eli Wallach from The Good, the Bad and the Ugly, and Alan Hale and Tina Louise of Gilligan's Island fame. 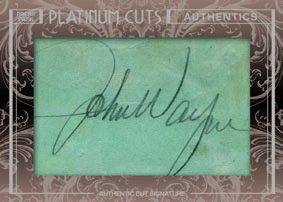 Although noted in some of the examples above, it is worth noting that 2013 Press Pass Platinum Cuts includes autographs from living figures as well as those who are deceased. Cut signatures can be tricky sometimes due to their varying sizes. To help combat this, 2013 Press Pass Platinum Cuts cards come in two sizes: standard 2.5" by 3.5" and jumbo 3.5" by 5.25". Every card in the release is serial numbered. The production run includes nearly 2,000 one-of-ones. 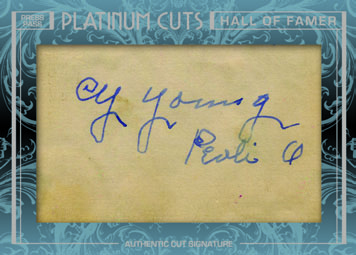 All cards come in a labelled BGS slab. 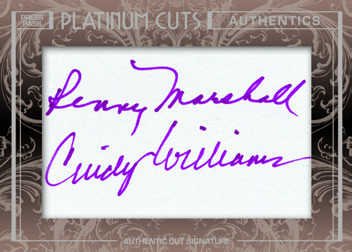 Download the 2012 Press Pass Platinum Cuts Inscribed Edition checklist here. Out of four boxes I did manage one major HOF baseballer and two previously unaware of silent film/golden era Hollywood stars. All had been deceased for some time so it was a decent series. Still hoping for a President.